Drop In Center is a community center for homeless people and the working poor in downtown Long Beach. 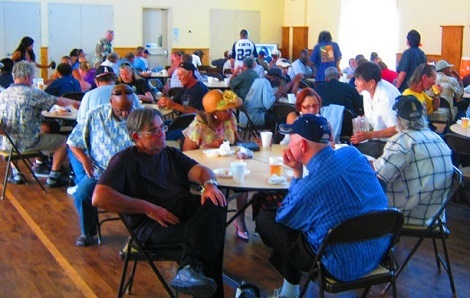 We strive to provide a haven from the weather and the harsh conditions of the streets on Sunday afternoons. Computer Lab provides access to the internet to find work, write resumes, find family or just surf the web. A ten workstation computer lab and helpful folks are available for anyone who may need assistance. The people will assist our guests with learning new computer skills (as time allows) in order to broaden their job opportunities. If you are talented in that area, we can use more volunteers. Document Preservation Project offers an innovative solution for homeless people to scan and “back up” their important personal papers which often get lost, stolen or destroyed by the weather. We can send them to each person’s private e-mail account. Lost information can then be recovered at any time. Doctor and Nurses come once a month. These dedicated volunteers monitor blood pressure, blood sugar and help with wound care. They provide what information and council our guests may need often addressing questions about depression, addiction issues and many other health concerns. Supplies are provided including clothing, plastic tarps, blankets, sleeping bags, dehydrated food, hygiene kits, detergents and other items necessary to survive the hardship of living in the parks and on the streets. Please note: clothing donations may only be dropped of on 4th Sundays between 8:30 and 1pm. Thank you!